In the fall of 1956, a small newspaper advertisement appeared in the pages of The Suffolk Times. It said, in effect, “Wanted – people interested in starting an amateur theater. Meet in the basement of Floyd Memorial Library, Greenport,” and a date was given. A small but eager group came together to meet Jim and Doris MacCammond, then living in Orient, who had placed the advertisement. Jim was an art instructor at the Greenport School. Doris had graduate training in dramatics and speech. They were experienced and skilled – well qualified to organize a play group. At that time the Orient Play Shop, which had been active for seven or eight years up to 1954, was inactive. The Greenport Teachers Association was interested in a fundraising event for May 1957, so the fledgling theater group and the teachers joined forces. Students and faculty of Greenport School and community members from Southold to Orient gathered together to put on The Man Who Came to Dinner. The original choice for the lead role was unable to complete his assignment, so Jim MacCammond played Sheridan Whiteside and Doris directed the production. Lighting and stage settings were improvised to fit he somewhat odd dimensions of the high school stage. The new theater activity drew members from all along the North Fork. Scientists and others, from the then relatively new Plum Island Laboratory, teachers and members of Orient Play Shop combined to produce Harvey, directed by Dorothy Robertson, and Bus Stop, directed by Connie Overton. These were produced in Greenport. The affairs of the group became more organized. We elected our first president, George Cottral of Greenport, and a year later moved forward to formal incorporation. The North Fork Community Theatre next staged Visit to a Small Planet, All My Sons and Romanoff and Juliet. More people had joined the group, bringing talents which contributed to successful shows. However, the Greenport High School stage was unwieldy and our productions had to be dovetailed into the school schedule. We moved to Orient, where the small stage and more intimate auditorium of Mechanics Hall served us well for Night Must Fall and Born Yesterday. In the winter of 1960, Mr. James Moreno came to see our shows in Orient and told us he would equip and open a professional theater in Mattituck. This was our opportunity for a theater home. We moved to Mattituck in the fall of 1961 and opened with The Glass Menagerie, directed by Frederic Newell. In 1971 NFCT members Maureen and Don Cahill, parents of a theatrical family, wanted to put on a show. 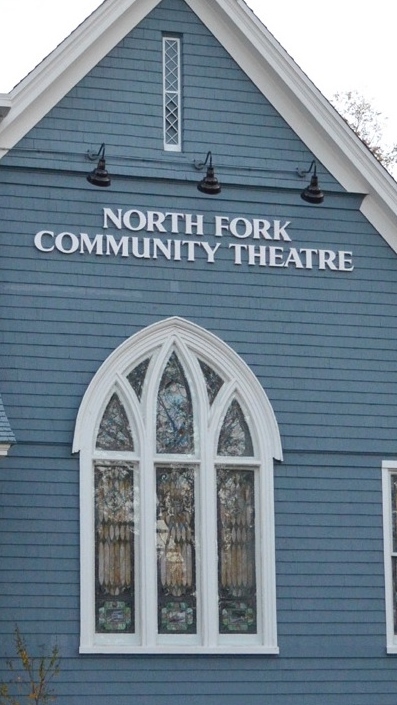 They got permission to use the North Fork Community Theatre as their venue and called the program Youth on Stage. Summer musicals were put on independent of the theater for the next five years, overseen by Maureen Cahill and subsequent directors Sandra Scoppetone and the Szymanowski sisters, Linda and Joanne. In 1977, the NFCT officially took the summer shows under its wing, beginning with Li’l Abner.